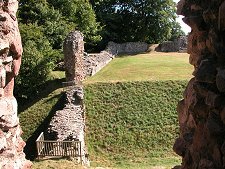 Norham Castle was a mighty stronghold located on a rocky bluff on the south bank of the River Tweed. Its location, just half the river's width away from the border between England and Scotland, earned it the title of "the most dangerous place in England". 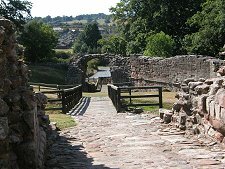 Yes, Norham was a mighty English stronghold, and features on Undiscovered Scotland because it played a key role in 400 years of Scottish history. 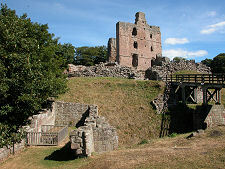 Between 1136 and 1513 the Scots successfully captured Norham Castle four times and were repelled five times. 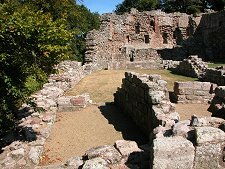 Norham Castle was first built by Bishop Ranulph Flambard of Durham in 1121, with the aim of protecting his lands from "robbers and Scots". The original castle probably covered much the same large area you see today. The inner ward would have focused on a stone Great Hall surrounded by a timber fence and ditch. The castle's defences were soon tested, and found wanting. 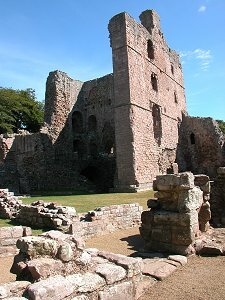 David I of Scotland took Norham Castle in 1136 before quickly returning it to the Bishop. The Scots again took the castle in 1138, this time destroying much of it. Between 1157 and 1170 Bishop Hugh de Puiset of Durham rebuilt the castle on a much grander scale, including the Great Tower which in much modified form still impresses today. King John further developed the castle from 1208 and 1212, which helped enable it to withstand a 40 day siege by Alexander II of Scotland in 1215. 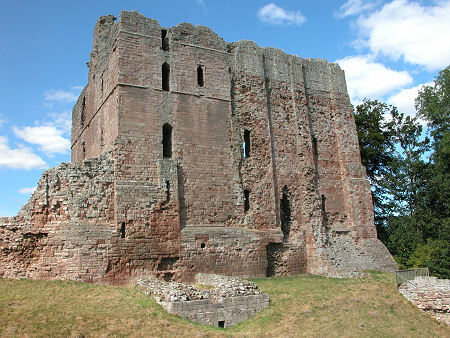 In 1291 Norham hosted Edward I in his role as arbitrator between the 13 competing claims for the Scottish Throne. The Wars of Independence that followed saw Norham bypassed by invading Scots armies in 1311 and 1312 as too strong to attack. In 1318 Robert the Bruce besieged Norham for nearly a year, succeeding only in a temporary occupation of the outer ward. In 1319 the Scots besieged the castle, again unsuccessfully, for 7 months; and they tried and failed yet again in 1322. 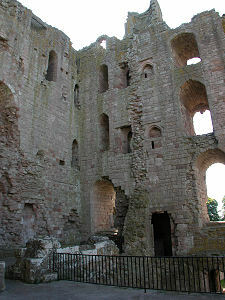 Norham Castle did fall to a Scottish attack in 1327, but following the Treaty of Northampton it was returned to the Bishop of Durham the following year. More building work followed in the early 1400s, including completion of the Great Tower. In 1464 Norham surrendered, this time not to the Scots but to the Earl of Warwick during the Wars of the Roses. The castle was further strengthened and there was another attack by the Scots in 1497, this time with the help of the great bombard Mons Meg (on view at Edinburgh Castle). Despite causing considerable damage with the help of Mons Meg's 330lb gunstones, the siege was unsuccessful. 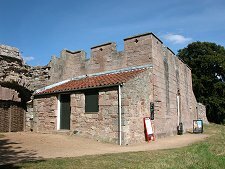 Repairs following the 1497 siege were completed just in time for the last attack by Scottish forces on Norham Castle, in 1513. Armed with a large collection of artillery the Scots caused massive damage to the castle before capturing it. Three weeks later the Scots suffered a catastrophic defeat nearby at the Battle of Flodden. Up to 10,000 Scots were killed, including James IV and most of the Scottish nobility. 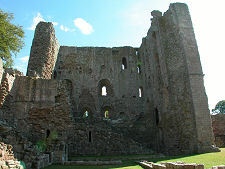 In the aftermath of the battle Norham Castle was again restored to the Bishop of Durham. Large scale rebuilding followed, designed both to repair the 1513 damage and bring the castle's defences into the artillery and handgun age. A lot of what still stands dates back to this time. 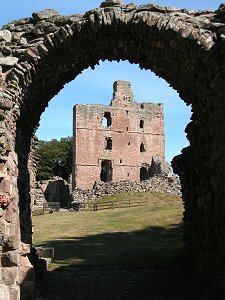 In 1559 Norham Castle was seized from the Bishop of Durham by Queen Elizabeth I when he refused to swear an Oath of Supremacy to her. Within 10 years the castle was considered unfit to garrison and the buildings had started to decay. Many owners and much stone quarrying later the castle was passed into state care in 1923, and is looked after by English Heritage. Today's visitor is struck first by the brutal impressiveness of the remains of the massive Great Tower in the inner ward, by far the most complete of the castle buildings (though actually a hollow three-sided shell when seen from the north). 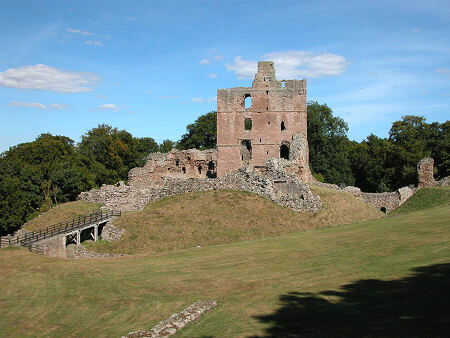 The second impression is of the huge scale of Norham Castle. The Outer Ward sweeps around in a broad arc before descending the hillside towards the west gate. Intriguing structures remain in the Inner Moat, but most of the interest lies in the Inner Ward, reached across a wooden bridge. 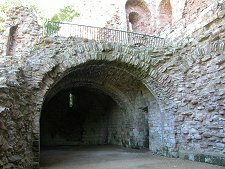 Here there are remains of the Great Hall and (more confusingly) the Great Chamber as well as the three surviving walls of the Great Tower itself. This can be climbed as far as first floor level, and much of the vaulted ground floor can also be explored.